I have obsession with Ikea fabric. Not in a crazy “I’m going to carpet my house and walls in the latest eclectic sailboat print” but in a “I have a special pile in my fabric stash that has about 10 different types of Ikea fabric” way. Heck, there were Ikea curtain fabric picnic blankets at my wedding, there is Ikea fabric stretched over canvases on the walls in my house and I’ve made multiple home sewn items featuring Ikea fabric- epic Iris shorts, anyone? So when it comes down conquering an anxiety inducing attempt to start sewing again I go with what feels comfortable and right. And for me that is a no brainer combo of Ikea fabric and Colette Patterns. For those who have been following me ol’ chunk o’ the internet for a ways now, you may remember I got the Colette Patterns book around Christmas time and had a brief flirtation with the Taffy blouse. After that the lovely book has become my reference guide for techniques and fittings but the patterns have been looking all sad and sulky. “Sew me, Amanda!” I could hear them whisper. But ignored the sad little pattern cries and was instead lured into sassy pink capes, crazy disco leggings and polka dot tea dresses. And then this happened. Bird attack! No, actually some therapeutic sewing. 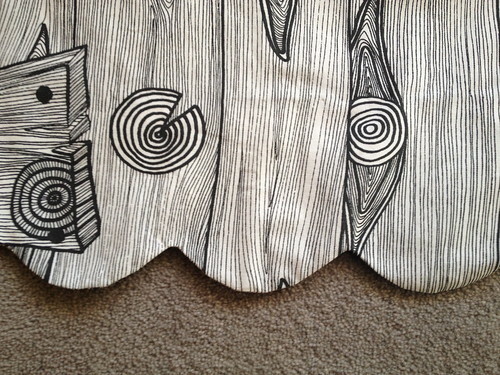 I need to state that I was not that enamoured of the wood panel when I selected it to make this skirt. It was more a “let’s axe through the stuff I don’t love so if this screws up I won’t be all sad face panda” rather then “this would look fab” kinda thing. But once I scalloped this sucker up I was officially in love. How can you not be with such adorable scallops? It’s Colette so it was super easy to to follow and work through as well as no adjustments needed. Honestly, it is like they make the skirts and shorts based on my measurements. How quick it was once I had cut out my scallop template. The freaking scallops. 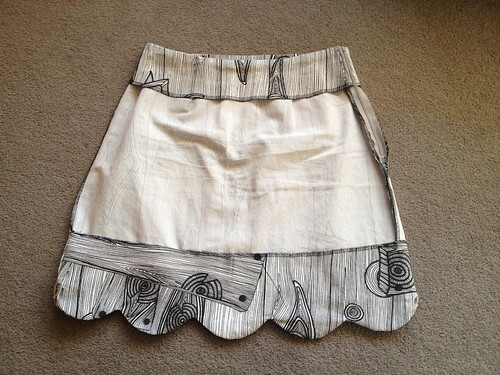 Those things have sassed up this a-line skirt like nobody’s business. I’m going to waistband this sucker. I want to learn how to do piping and nice simple project like this where I could pipe between the skirt and the waistband wouldn’t be too scary. Keep my scallop tracing template. I’m a lazy lady and that thing took me a good 15 minutes I could have been sewing. Neaten up the inside more. I was thinking this would be a muslin so was fairly sloppy about the whole process so I shall be fancier next time. 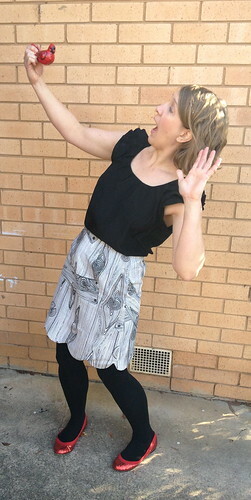 This skirt is totes becoming part of my work wardrobe. I’m planning to cardi and brooch up this ensemble for Monday. 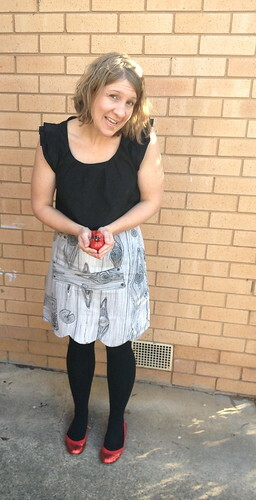 Who is going to be the sassiest museum educator in Canberra at work next week? Well, I do believe it shall be me. Let’s get educated in awesome, I say! So how do I wrap this up succinctly? Ah, I’ve got it! Wood panel is the new neutral. Get on it! Thanks, Symon! I am so happy with how it turned out. And it handled a crazy day at work yesterday with ease. 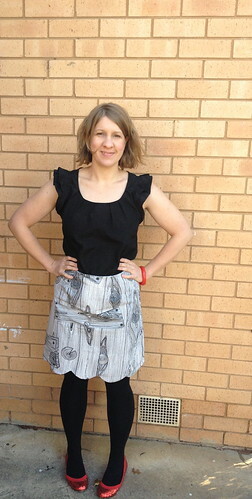 $10 skirt win! Cute! And thanks for the links to previous projects, I’m a new reader so it’s nice to easily see some past highlights! Thanks, Rachel! And you’re most welcome. I’ve got a few projects kicking round so it is nice to reflect sometimes! 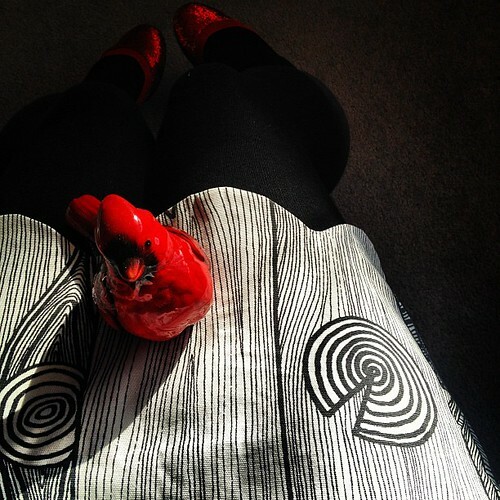 I recognise that birdie… ;D LOVE the skirt! Oh how I love this skirt, I may have to completely steal your idea by going to my nearest Ikea store, buy that fabric and make the exact same skirt. Delicious! Can I just also add, I’ve only just found your blog and absolutely adore your style! Rachel- give in to the Ikea fabric! It is totally worth it 😀 We all need a little wood panel neutral in our lives!